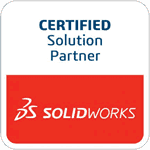 Springville, CA, March 13, 2013 – TEDCF Publishing, a SolidWorks Solution Partner and producer of interactive, multimedia training courses, today announces the availability of SolidWorks 2013: Professional Modeling. The course has over 6 1/2 hours of instruction that gives users a sound approach to Part Modeling. David Melvin, PE, the author of the course, builds a foundation of knowledge, designed to speed up workflow and increase overall performance. The course is the first part in a four part series of courses for SolidWorks 2013 that will be released this year. It is currently available in three formats: DVD, direct download, and through the TEDCF Streaming Video Service. Visit Professional Modeling 2013 to learn more and watch sample lessons.